Can anyone ID these cacti, and this succulent? The succulent is Haworthia, probably H. attenuata 'Zebrina' - next to it in the picture appears to be an Aloe, but how much light have you been giving it? It shouldn't be that tall and stretched out - it's reaching for more light. On the cacti, the right and left are Mamillaria; I'm terrible with identifying the species, though. 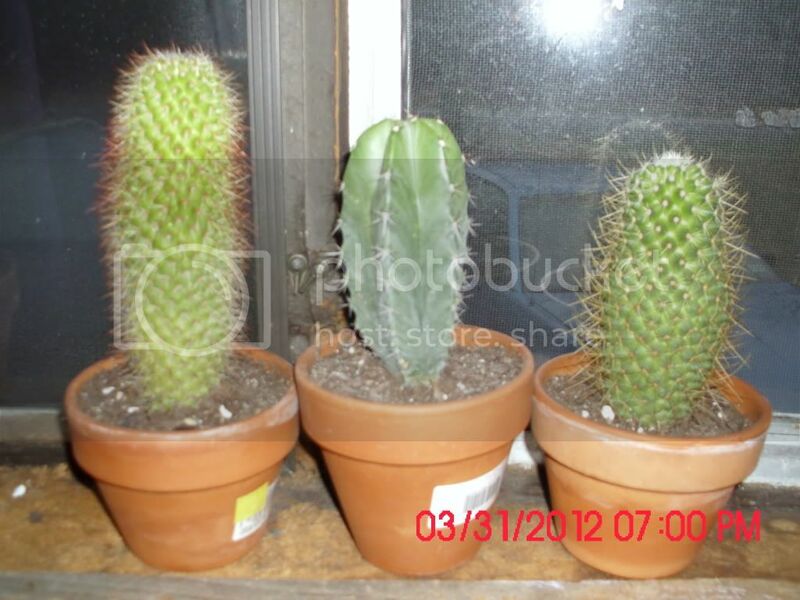 The middle one is Echinopsis. Thanks for the reply. I thought that Haworthia had no stem to it. The one I have looks like it has a stem in the center for sure. Do Haworthias have stems? 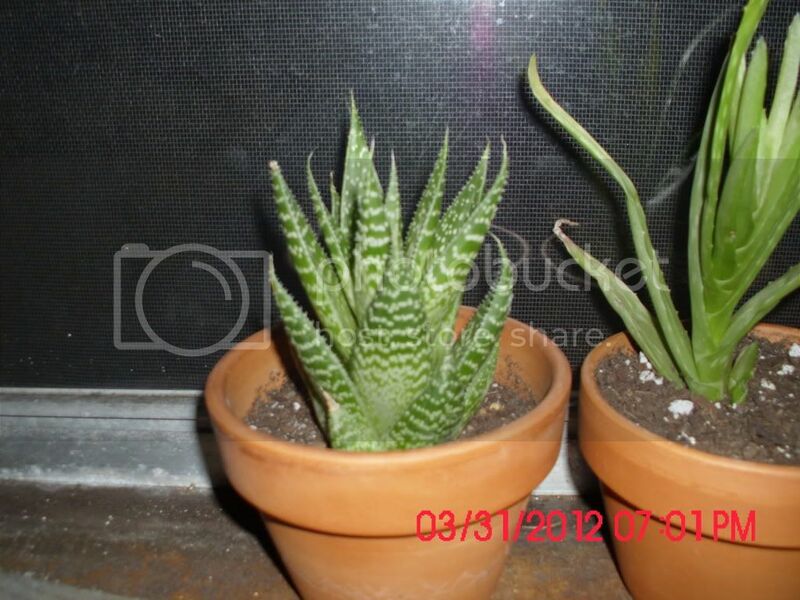 Also, someone had said that the middle cactus was a "Myrtillocactus Geometrizans"..........lol. I'll see if I can find any pics. You couldn't be more right about the light situation. The cats that she has are bad at knocking over my plants, and they can't take anymore abuse. I think I finally have a good window for them all, so they should do much better this year. Also, I stopped putting all my succulents out in direct sun, except my jade, and of course my cacti. 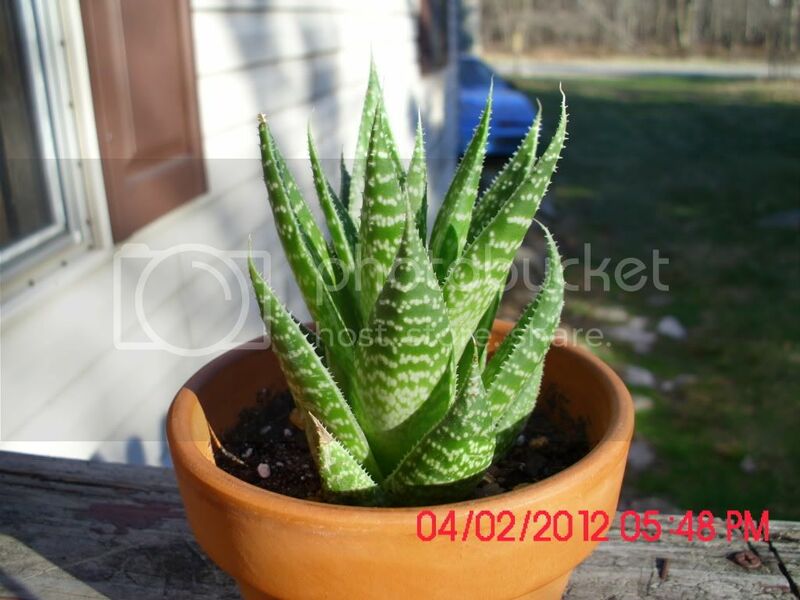 I know my aloes dislike direct sun, and they get burned. I've been told that the stripped succulent would not like direct sun either, so he stays in the window. What do you think of Haworthias having stems though? Yea I looked up pics of the Myrtillocactus Geometrizans and the spines looked completely different than the ones on my cactus (much thicker and larger). You must be right then. Still wondering what you think about Haworthias having stems though. Last edited by baileysup on Mon Apr 02, 2012 1:49 am, edited 1 time in total. The stem is a direct result of not enough sunlight. I grow Haws and Aloes in full equatorial sun, and apart from some reddish coloration on them, they do just fine (and my aloes are huge). Perhaps add your location to your profile? It would be a lot easier to give you advice if we knew roughly whereabouts you are. In any case, it's never a good idea to move any plant from indoor winter quarters directly into full sun, no matter where you live - you should always step them into it so that they don't get too shocked by the transition. This goes double for succulents, which have a different photosynthetic system from most other plants, and which are very sensitive to changes in their light levels. In terms of gardening, Ecuador is perfect in many respects, but the exact area I live in is by no means ideal for many plants. I live in a high-altitude desert, and I can't grow a nice head of lettuce to save my life, but cacti and succulents? They're definitely my thing. I have quite a few Echinopsis (which is why I can be fairly certain about your middle cactus - there are a few characteristics that Echis have that most other cacti don't), and also a fairly large collection of Aloes, Gasterias, and Haworthias.